Okay, we’re now at mid-March, 2017. A year ago this month we were in the midst of Kickstartingthis project. How have we done? What are the hits and misses, successes and failures we’ve had along the way? I hadn’t originally intended to stop in the Colockum Wildlife Area. In fact, it was a last minute decision made at a pit stop for gas. My original destination had been the Toppenish National Wildlife Refuge before continuing on to pick up my daughter from a camp in Central Oregon. I’m glad I stopped and made the decision to stay instead of continuing as it turns out the main accessible areas of Toppenish are flooded with anthropogenic noise, mainly from the the busy highway that connects to the main entrance. While it would have helped illustrate the problems with the invasion of human-caused noise pollution, it would have been a miserable and likely wasted trip. The 100,000+ acre Colockum Wildlife Area is located between the cities of Wenatchee in Chelan County and Ellensburg in Kittitas County. 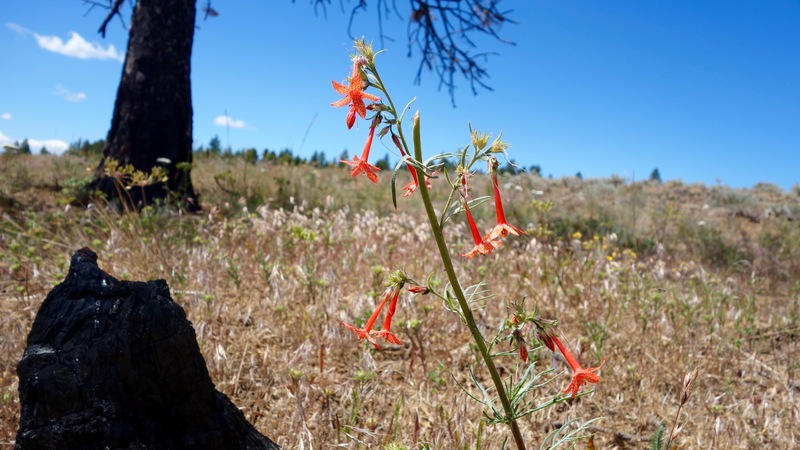 It’s well known among big-game hunters for its plentiful populations of Rockies Elk and Bighorn Sheep and among the local ranchers that let their herds roam freely on the BLM lands that make up a portion of the Area. I’m neither and was unfamiliar to the area, so it was new to me! Deep within the Colockum, along Naneum Ridge Road is the Arthur S. Coffin Game Reserve, a no-hunting safe zone for the elk. We’ll get back to that in a moment. 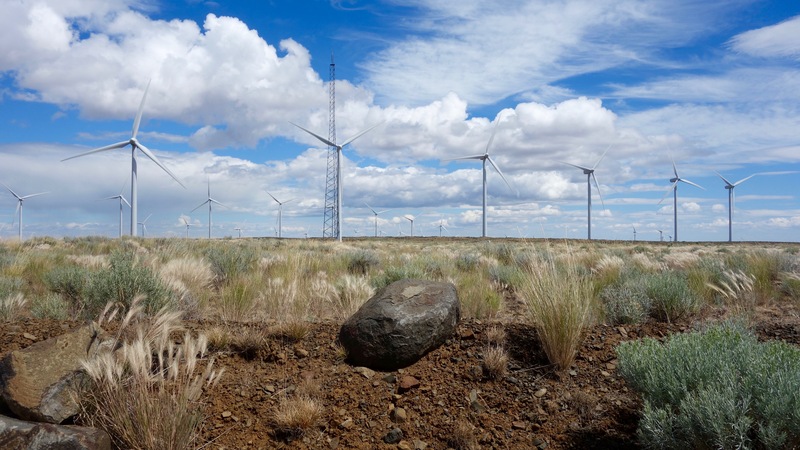 I used two access points from the south during my stay, the first through the Wild Horse Wind and Solar Facility on Vantage Highway. It was this facility that first led me to venture into the Colockum. I was early in my drive and had plenty of time on hand, so I was Lured by the sight of the giant wind turbines on the hills, I wandered up to see if I could record. Fortunately there is public access to the full facility, so in I went. Stopping off at the main information building I saw a map of the area that showed the facility road heading off deep into the mountains. After recording the turbines for a bit, I set off to see how far I could drive in. Turns out you can go pretty far but only very slowly. Elevations range from 480 feet to 6,875 feet, with steep, rocky slopes and a rolling series of ridges and canyons. Year-round surface water is scarce, leading to dry, rocky “roads” that are inaccessible without four-wheel drive. But even then it got hairy and there were times I turned back. It was the first time in my life I ever yearned for a high-clearance vehicle. About 30,000 acres are conifer forest and the balance is predominantly shrub steppe. 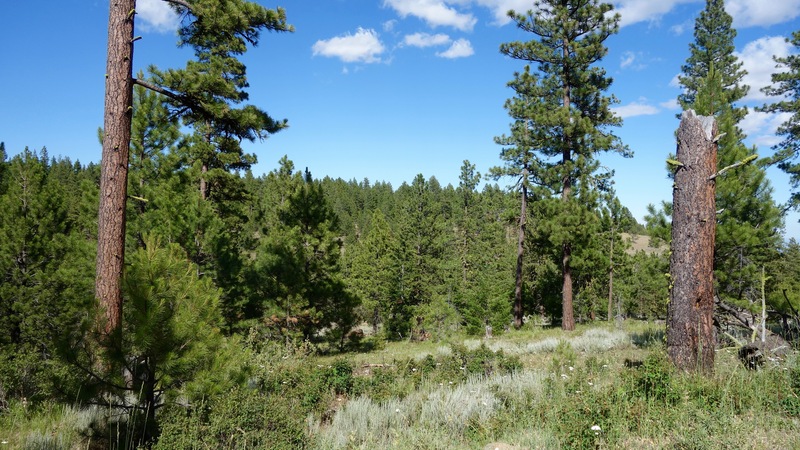 Vegetation ranges from the lower elevation shrubs and bunch grasses into Ponderosa Pine, then to higher elevations with denser stands of timber, mostly Douglas fir, grand fir, and some larch. Grasslands interspersed with rock outcrops and shrub-steppe communities dominate hillsides in transitional zones. As mellow as the Poorwill is, the Nighthawk loudly makes its presence known, not with calls or song, but with loud “booms” made by its wings when pulled in for a dive. When I first heard Nighthawks in the field I thought it was a sick Raven or aggressive distant bullfrog (flying bullfrog?). Indeed, they are sometimes known as “bull-bats” as they often are found feeding in the dark with the mammalian fliers. Other singers throughout the that morning’s chorus include Juncos, Creepers, Woodpeckers, Yellowthroats, Chickadees, Swallows, Sparrows, Waxwings, and even a confused Owl around the 28 minute mark. While the Colockum is a popular hunting destination, at this time of the year there is no hunting to be had. The whole area was quiet, mostly absent of humanity, including campers or hikers. In the three days I spent here I saw only one other face. I had plenty of non-human friends keeping me company, so I was alone, but not lonely. 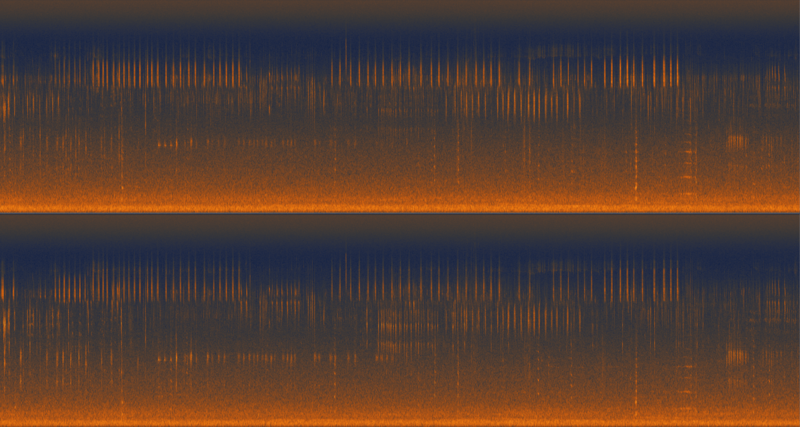 Izotope’s RX, and what you see is a beautiful emergent composition. There’s an order without it being ordered. All the voices are competing for their own space. The easiest way to win that space is to carve out a slice no one else has claimed. When that happens, the result is a complex tapestry of life. I only wish I could have been around here 500 years ago to know what it was like before European American settlers began cutting down the forests. On my last evening and subsequent morning I finally discovered why the area is so popular for hunters. Rounding the bend from Colockum Road to Naneum Ridge, I entered the Arthur S. Coffin Game Reserve, a large “safe zone” for the Colockum elk herd and bighorn sheep. As I sat outside the fence line I could hear the bugles and screams of bulls (male elk) and the dewy chirps of the cows (female elk). Mostly it was the cows and young. The young were so springy and lively I had to feel tired for the cows just by watching. Towards twilight they wandered off into the surrounding forest, but not before I managed to get a picture. It turns out they had wandered back and settled down for the night not far from my tent. 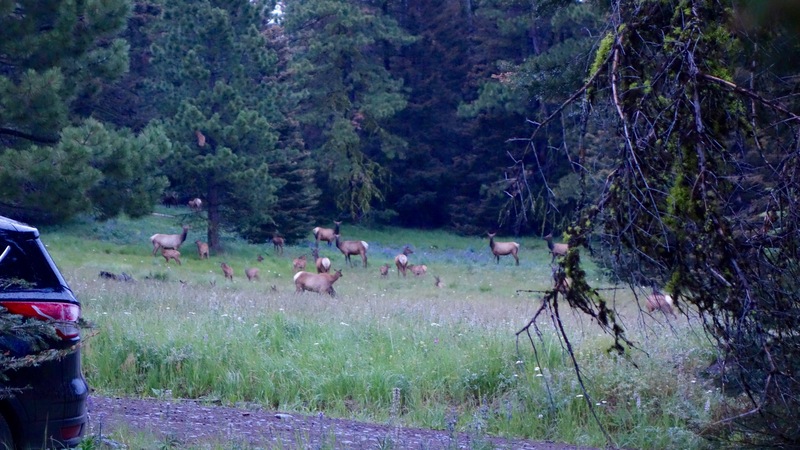 In the early morning, before first light, I woke up and started recording a beautiful dawn chorus, from the distant faint calls of a coyote pack and the wake-up alarm of a lead bull elk to the silent march of the post-chorus herd wending past my microphones. Magic. I can’t wait to come back here. And I will… I’m writing this after my second trip to the Colockum two months later, during rut and just before hunting season opened up. Look for that write-up coming later. My experience here was strong enough that I’ve determined this to be one of my return destinations throughout the year and over the years to come. Spring in the Colockum is something I’m eagerly looking forward to hearing.